When it comes to printing, there are various techniques that have been developed throughout the years. The history of printing can go back as far as stamps in the olden times, and it has definitely evolved significantly since then. After the introduction of press printing, the technology rapidly moved forward and we have a lot of modern printing technologies available today, including 3D printing. Indeed, with the incredibly versatile Xerox printers available today, we can see how technology has progressed. Printing was believed to first have been done in China in 618 A.C., with the first use of wooden printing done in the 1300s. The first colour printing was done in 1457 by Fust and Schoffer, while the first weekly newspaper was published in 1605 in Antwerp. This shows just how far printing has come since then. Newspaper printing picked up from there and eventually moved on to magazines in later years. In 1819 the rotary printing press was developed by Napier and in 1846 the cylinder press was invented. This press could print 8,000 sheets an hour, allowing publishers to significantly increase production. In 1933 Esquire debuted the first men’s magazine, with Time Magazine following in 1923. Since the ‘80s, printing was computerised, making production digitised and the text drafted in desktop publishing. 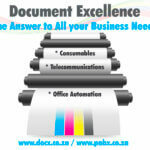 Document Excellence specialises in selling and leasing Xerox printers, and we provide a variety of printing solutions for clients throughout Johannesburg. Contact us today to find out how we, as a Xerox printers partner, can supply you with all the printing solutions that you might need at the office or at home.